a.The Subscriber purchases an Alarm System. b.They contract for Central Station Monitoring. c.A Technician installs that contracted security system. d.The Subscriber's Control Panel is programmed for a specific Communicator Format and its related Panel Zones to properly report various events, alarms, and supervisory signals, based on the specific needs of that Subscriber. e.Frequently, the Subscriber's Alarm System is a little bit different than the standard setup (aren't they always? ), so some custom CSID Zone definitions are required. ❑This CSID Zones Form provides the means to identify Exceptions to the standard predefined Panel Zones for the Communicator Format programmed into the Control Panel installed at the Subscriber's Premises. ✓Communicator Formats are entered to identify the transmission formats of the Communicators your Company is installing (most are predefined). ▪A full set of default Panel Zones should be defined for each of these Communicator Formats (most are predefined). ✓When the Subscriber's Central Station Data is entered within the Edit View of the Subscribers Form, the CSIDs reported by their Alarm System are identified in the Subscriber Panel(s) section of the Edit View's Monitoring Tab. ▪In this Subscriber Panels section - where the CSIDs for the Subscriber are entered - a Communicator Format is assigned to each CSID - and so that Communicator Format's Panel Zones are automatically inherited by that CSID when it is entered in the Subscriber Panels section. ▪A Subscriber may have multiple Subscriber Panels (i.e., CSIDs) and each of these may (but probably won't) report using a different Communicator Format. ✓The net result is that each CSID identified in the Subscriber Panel section will inherit all of the default Panel Zones that have been defined for its assigned Communicator Format. ✓The default Panel Zones (for the Selected Communicator Format that was installed in the Subscriber's Alarm System) may not match the actual purpose, description, and/or notification rules of the Alarm Signals that will be sent by this specific Subscriber. 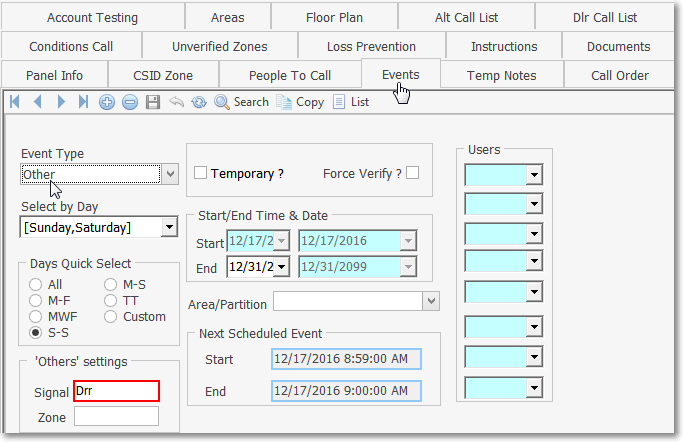 1.More information is needed to clarify a particular event or alarm than what was provided in the default Panel Zone record. 2.The default Panel Zone record's Signal ID (and/or Physical Zone) is being used for a completely different purpose for this CSID. 3.There are multiple - non-standard - Physical Zones for the default Panel Zone record's Signal ID. 4.The Subscriber's default Calling Order for Notifications is not sequenced correctly for some Alarm Signals. 5.Specific processing steps will be different than those defined in the default Panel Zone record. 6.There may be a need to define an additional Signal ID (and perhaps also a Physical Zone) which is not actually sent from the Receiver, but rather is defined to alert an Operator to perform some special task for a specific Subscriber, or for the Central Station itself (see the "User Defined Signal IDs" section below). ▪to properly interpret that signal, the system searches the CSID Zones table first for the appropriate alarm processing information. ▪If no matching Signal ID - and if available - Physical Zone combination is found there, it then looks at the Panel Zones that were predefined for this Subscriber's Communicator Format. ▪If neither source (and some other variables outlined below) contains the information for the Alarm Signal that was transmitted, is it reported as an Invalid Alarm. ✓Therefore, the Panel Zones Form allows you to define the default information for the most common purpose of the Alarm Signals sent by your Subscribers. ✓Information representing Exceptions to these Panel Zones are defined for Specific Subscribers using the CSID Zones Form. 1.Exact Match on a CSID Zone Override (Signal ID & Physical Zone). 2.Exact Match on a CSID Zone (Signal ID & Physical Zone). 3.Exact Match on a Panel Zone (Signal ID & Physical Zone). 4.Partial Match on a CSID Zone (Signal ID). 5.Partial Match on a CSID Zone using the Wild Card feature (Signal ID). 6.Partial Match on a Panel Zone (Signal ID). 7.Signal ID from the Receiver + CSID Zone's Physical Zone. 8.Signal ID from the Receiver + Panel Zone's Physical Zone. 9.Reported as an Invalid Alarm. •Why a special, internally defined Signal ID (and optionally a Physical Zone) which cannot be transmitted from the Subscriber's Control Panel, may be required. ✓A CSID Zone record may be entered for the purpose of defining a required task, and must match a special Event record, that triggers an Alarm Signal to remind an Operator that a required task must be performed. ✓See Other Events for information on entering the matching 'Other' Settings on the Events Form. ➢Important Note: This 'Others' Settings feature is quite different than the "Other" Dispatch selection explained below. •Open the Subscribers Form and Retrieve (F2 Search) the appropriate Subscriber's record. •Click on the Monitoring Tab to view the Central Station Data section. •Click the CSID Zones tab. ✓The Zones sub-tab is selected by default. ✓This CSID Zone Form may be Re-sized by Dragging the Top and/or Bottom up or down, and/or the Right side in or out. •Navigation Menu - The Navigation Menu is located at the top of the CSID Zone Form. ✓This Navigation Menu provides the normal Record Movement, New, Edit, Delete, Cancel, Save, and Refresh options; as well as the Print, Search, Copy To, Zone Image, Notification List and List options (see the "Other Options on the Navigation Menu for this CSID Zones Form" section below for information about the Print, Search, Copy To, Zone Image, Notification List and List options). 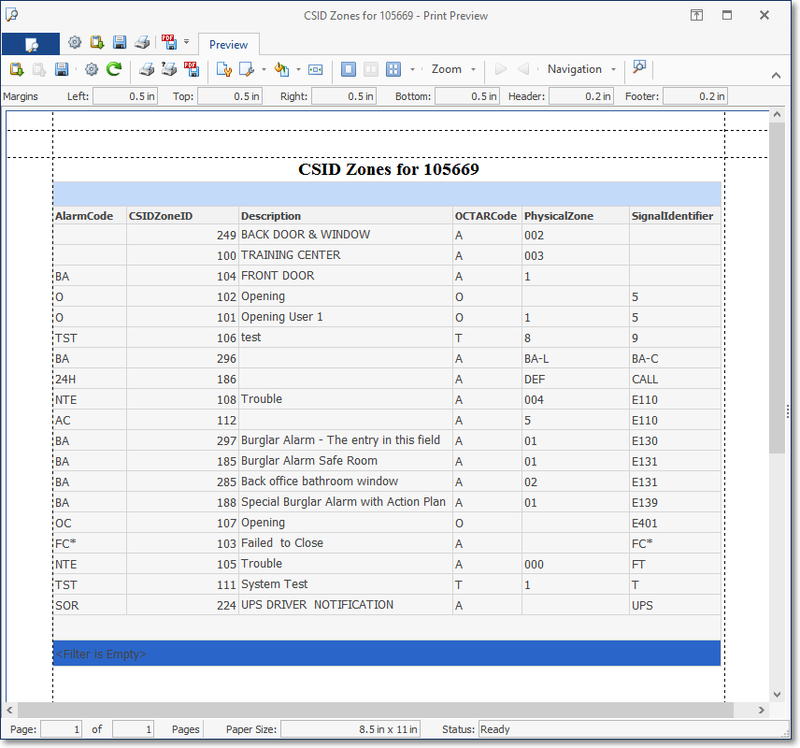 •Zones tab - The details of the currently selected CSID Zone record are displayed below the Navigation Menu within the Edit View tab at the center (Main Body) of the CSID Zone Form. 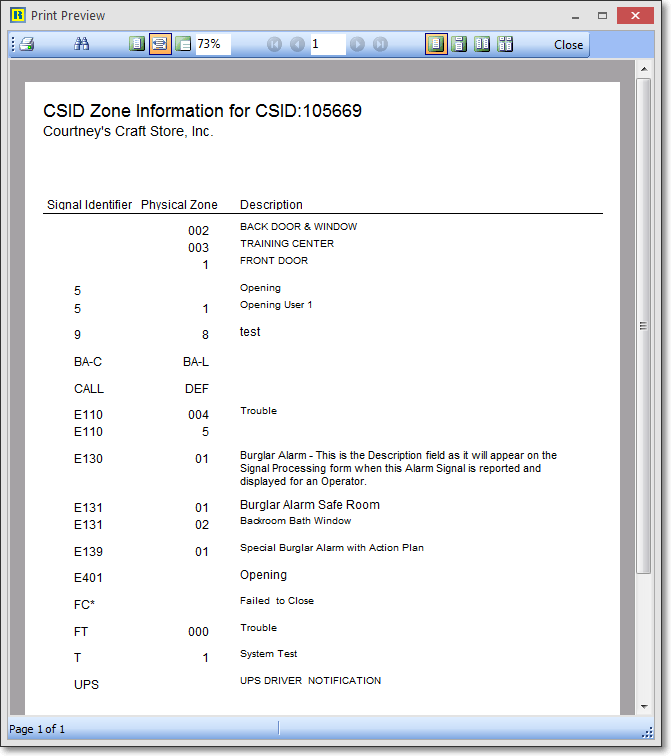 ❑Defining a CSID Zone: Select the Zones tab then Click the Icon to start a CSID Zone entry. •Signal ID - Enter the specific Signal Identifier for this signal, keeping in mind the Communicator Format that was assigned to the Subscriber's CSID in Subscriber Panel(s). ✓"Wild Cards" may be used when defining the Signal ID. oUnderscore - The underscore mark (" _ ") may be inserted anywhere within the Signal Identifier field to represent that another (any other) character may be received in that same position. oPercent Sign - The percent sign (" % ") may be inserted at the end of the Signal Identifier field to represent that any number of additional characters, from that position on, may be received. ❖See Using the Wild Card Feature for more information about this feature. •Physical Zone - Enter the Zone Code, if one is transmitted along with the Signal Identifier. ✓For the SIA Format Only - When the additional modifiers: PT (point), ID (user id), or RT (rf point) are received, the number that follows these modifiers will be placed in the Physical Zone field appended to actual Physical Zone number. ✓If a Wild Card was used in the Signal ID, a Physical Zone must be entered. •Alarm Code - Use the Drop-Down Selection List provided to Choose the appropriate Alarm Condition. •OCTAR Code - Use the Drop-Down Selection List provided to Choose (the list is shown below) the type of signal or event you are defining. •Operator Action - If this is a Active Signal (one that needs some type of Operator Response), indicate the Alarm Processing step(s) the Operator is to take when this Alarm Signal is received. ✓Response Needed? - Check this box when some type of Operator Response is required. ▪Whether or not the Response Needed? 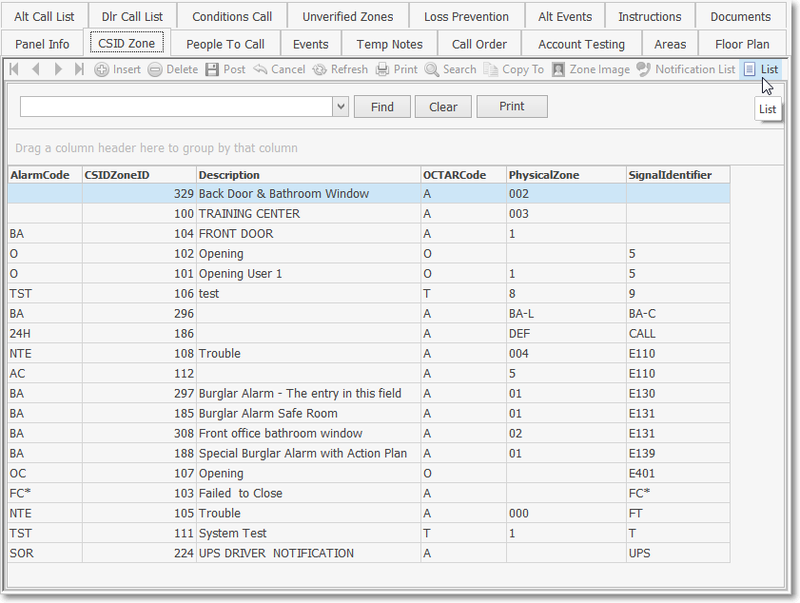 box is Checked, the Call List section with the Available To Call and Call Order columns will be accessible. ▪If Response Needed? is not Checked, it will be considered a Passive Signal (one that does not need any specific Operator Response) and no other Operator Action or Notification options will be available. ▪Note: For Communications Module Users - When using the Off Test Warning feature (which notifies a Technician via Email that an Account which she/he placed On Test is about to come Off Test), to have an Operator also get this Off Test Warning Signal, Check the Response Needed? box. ✓Verify Signal? - Check if this Signal is to be Verified by telephoning the premises in advance of any Dispatch, or other Notification process..
✓Dispatch - If this is an Active Signal, use the Drop-Down Selection List to Choose (the list is shown below) the type of response that is needed. ▪Fire = Notify the appropriate Fire Department of the reported Fire Alarm Condition. ▪Medical = Notify the appropriate Medical Emergency Response Service of the reported Medical Alarm Condition. ▪Police = Notify the appropriate Police or Sheriff's Department of the reported Burglary, Silent or Hold-Up Alarm Condition. ▪Other = Notify the appropriate Responsible Person responsible for responding to the reported Emergency Condition (also see Other Call below). ▪None = No specific "Dispatch" related Response is needed (see ØNote below). a)The Comments entered on the Central Station Data Form should clearly reflect that a Guard Response is required for any Burglar Alarm signals. b)The CSID Zone records defining these events should be Checked Response Needed? and have <Other> selected for the Dispatch type. c)The Security Company's emergency contact number should be entered in the Subscriber's People To Call list. d)Select the record representing that Security Company when defining who is contacted for the <Other> response (see "Other Call" below). e)Be sure that the CSID Zone's Description field also clearly reflects this response requirement (see "Other Call" below). ✓Other Call - If the type of Dispatch Response that was selected above is <Other>, use the Drop-Down Selection List (immediately below the Dispatch box) to Choose the appropriate Name, from the Subscriber's People To Call table, of who is to be notified. ✓Action Plan - If there is a Response Needed for this Alarm Signal and the normal Operator Guided Response is incapable of providing the appropriate instructions for the Operator, you may instead use a predefined Action Plan to dictate the exact Signal Processing steps that are required. ▪Use the Drop-Down Selection List to Choose the appropriate Action Plan for processing this Alarm Signal. ▪You may Right-Click in the Action Plan field to set the order of the Drop-Down Selection List list by Choosing either ID or Description order, as desired. ✓Assign the appropriate Automated System Action Plan and optionally a Signal ID and/or Physical Zone to any CSID Zone that will be processed by the MKSASP application. ▪Physical Zone - Optionally, enter the Zone Code, if one will be transmitted along with the Signal Identifier. ▪Alarm Code - Use the Drop-Down Selection List provided to Choose the appropriate Alarm Condition Code. 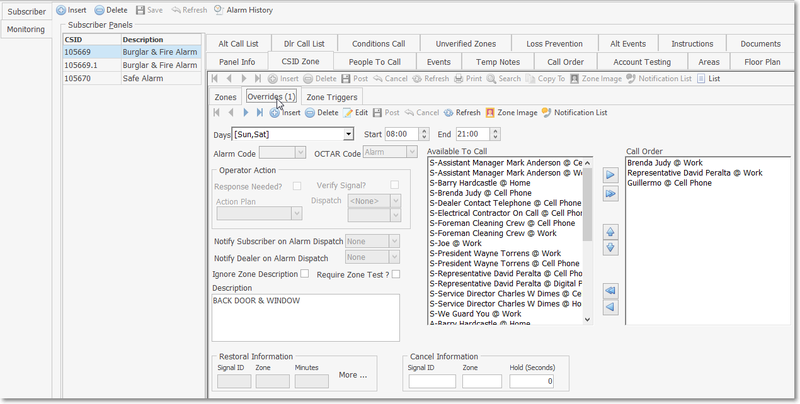 ▪OCTAR Code - Use the Drop-Down Selection List provided to Choose Alarm. ▪Response Needed? - Check this box when the Response is to be provided by the MKSASP application. ▪Action Plan - Because there is a Response Needed for this Alarm Signal - which will be provided by the MKSASP application - a predefined Automated System Action Plan is required. Use the Drop-Down Selection List to Choose the appropriate Automated System Action Plan Plan for processing this Alarm Signal. ▪Call Order - Set the Call Order with the People To Call who are to be notified of this Automated System Action Plan related Signal. ✓Notify Subscriber on Alarm Dispatch - Use the Drop-Down Selection List to Choose the Subscriber's notification preference. ✓Notify Dealer on Alarm Dispatch - Use the Drop-Down Selection List to Choose the Dealer's notification preference. •Ignore Zone Description - This special setting is used to properly process certain types of Supervisory Signals. ✓Check this box to ignore the Zone Code (Physical Zone) and it's Description, and instead use the default Description field information defined in the Panel Zones record when this Supervisory Signal is displayed for an Operator. ✓This is because - when a Supervisory Signal is received - it generally consists of a Signal Identifier (which identifies the Problem or Situation) and also frequently includes a Physical Zone (which actually does not represent a "real" Zone within the Alarm System). ▪The Signal Identifier is virtually always predefined in the Panel Zones Form of the Communicator Format (identified in the Subscriber Panels section) installed at the Subscriber's premises. ▪There is a possibility that this Signal Identifier + Zone Code (Physical Zone) combination might be misinterpreted as an Actual Zone in the Alarm System in use (e.g., LB+001). ▪This would occur when the Signal Identifier in the Panel Zones record is matched with a Physical Zone identified in a CSID Zones record creating something like " Low Battery/Front Door" when there is no battery at the front door (it's in the Control Panel). •Require Zone Test? - Check the Require Zone Test? box if you want this specific CSID Zone to be included in the Unverified Zones process and included in the Zone Test Verification Report (see "Understanding the Unverified Zones feature and it's related Zone Test Verification Report" section below and the associated chapters), and to be included in the Web Tech Service Zone Testing list (see the Web Tech On Test Panels & Zone Testing chapter for more information). •Description - Provide a clear, concise description of this Signal ID and/or Physical Zone. ➢Note: As noted above, for Accounts using a Security Company for their Burglar Alarm Response, this Description field should also clearly reflect this response requirement. •Click the Icon to record this CSID Zone. ❑Understanding the Unverified Zones feature and it's related Zone Test Verification Report. •The CSID Zones Form has a Require Zone Test? Check Box field (see "Require Zone Test?" above) which identifies which specific Zones will be tracked by the Zone Test Verification Report and the Unverified Zones Form. ➢Note: This feature will not be available unless the VerifyZones option is set to True ("T") in the Company Settings dialog available in the Company tab of the User Options Form. 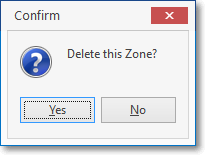 If the VerifyZones option in the Company Settings dialog is set to False ("F") - regardless of whether or not any Require Zone Test? box is Checked on any CSID Zones Form - neither the Unverified Zones dialog, nor the related Zone Test Verification Report, will be available. ✓The Unverified Zones dialog is used to (re-)set the Test Status of an Account (Subscriber Panel) that has been Placed On Test by a Technician working on that system at the Subscriber's premises. ✓The Unverified Zone dialog is accessed using a button located on the Subscriber Panels section of the Central Station Data Form, on the Central Station Maintenance Menu in MKMS, and on the Miscellaneous Menu within the Sub Info (F2) Form in MKMSCS. ✓The Zone Test Verification Report displays the current Test Status of each of these Accounts. ✓All Zones that are displayed may be Reset to a Waiting ("W") Test Status, if needed. ❖For Web Tech Service Users: See the Web Tech On Test Panels and Zone Testing chapter for additional information. a.Instead of Checking the Response Needed? box, complete the Restoral Information section (described below). b.When this CSID Zone Signal is received, because there is Restoral Information defined, it will immediately place the Signal into the Subscriber's Alarm History while waiting for that Restoral Signal. c.The amount of time that the system will wait for the Restoral Signal to be received, before creating the Failed to Restore Signal, is measured (and entered) in Minutes. d.If the Alarm Event or Signal, that indicates this CSID Zone has been successfully restored, is not received within the required number of Minutes, an FR* Alarm Condition Alarm Event will be generated automatically by MKMSCS. e.Because of this, if the default Panel Zone with this Restoral Information is not appropriate, a separate FR* CSID Zone record must also be defined as follows. ▪Response Needed? - Check in the Response Needed? box of the FR* CSID Zone entry. ▪No Physical Zone information should be entered. ▪Operator Action - Define the appropriate Operator Guided Response (i.e., Response Needed?, Verify Signal?, and Dispatch information) for this FR* CSID Zone entry. ▪Optionally, because this additional FR* record is a Response Needed? "Failed To Restore" Alarm Signal, if the fields that identify the normal Operator Guided Response (i.e., Response Needed?, Verify Signal?, and Dispatch as shown in the illustration immediately above) are not capable of providing the appropriate instructions for the Operator, you may instead use a predefined Action Plan to dictate the exact Signal Processing steps that are required. ▪If you do need to assign an Action Plan, use the Drop-Down Selection List provided to Choose that Action Plan for processing this "Failed To Restore" Alarm Signal. ▪Response Needed? - Do not Check the Response Needed? box because this is actually a Passive Signal. ▪Signal ID - Enter the corresponding Signal ID representing the Restoral of the originating CSID Zone's Signal ID. ▪Zone - Optionally, enter the Physical Zone representing the Restoral of the originating CSID Zone's Physical Zone. ▪No data is entered in any of the Restoral Information fields. i.When this Restoral Signal is received, the Restoral Information's Signal Identifier (and optional Physical Zone) combination would be considered an Invalid Alarm. ii.Furthermore, the proper recording of the Restoral will not occur, even if it is transmitted within the proper time frame. •Restoration Information: Enter the data requested below to identify the appropriate Restoration Information for this CSID Zone. ✓Response Needed? - You do not Check the Response Needed? box for this CSID Zone (which is the one reporting the problem). ▪This is because by completing these Restoration Information fields, it eliminates the need for an immediate response. ▪Either the required Restoral Signal will be received within the allowable time frame (thus completing the Signal automatically), or the "Failed To Restore" Alarm Signal will be generated automatically. ✓Signal ID - Enter the corresponding Signal ID representing the Restoral of the CSID Zone's Signal ID entered above. ✓Zone - Optionally, enter the Physical Zone representing the Restoral of the CSID Zone's Physical Zone entered above. ✓Minutes - If this Alarm Condition is not to be reported to the Operator until after a specified number of minutes has passed (allowing the Subscriber's system to restore to its normal mode in a reasonable period of time), enter that number of minutes here. ▪If the Restoral signal has not been received within this time frame, a Failed to Restore (FR*) Alarm Event will be generated for the Operator indicating that the original Event or Alarm Signal was not restored within the appropriate time frame. ▪Additional Restoral Information may be entered (by Clicking the More... button), if required (see Restoral Information for more information). ✓This Restoral Information and the Cancel Information (see below) are also included with the CSID Zones on the Subscriber Information Form Report. •For an Alarm Event or Signal which has a corresponding Cancel (Abort) Code that will transmitted by the Subscriber's communicator via a system reset/disarm action on their part. a.The time the system waits for the Cancellation Signal to occur is measured (and entered) in Seconds. b.The Alarm Signal is automatically placed on Hold in the Alarm Stack until that number of Seconds has passed. c.If the Cancel Signal is received within the designated time frame, the original Alarm Signal is taken off of Hold, and Internally completed. ▪The Alarm Signal is Logged into the Subscriber's Alarm History table with the Cancel (Abort) Code information included. d.If not Canceled within that time period, the Alarm Signal, which was placed on Hold in the Alarm Stack, will be reset to a Pending Alarm Signal. ▪The Alarm Signal is sent to the next available Operator in the normal manner. e.In addition, the actual Cancel Signal record, containing the Signal ID (and optionally Physical Zone) that is transmitted, must also be defined as a CSID Zone. ▪Because this is a Passive Signal, the Response Needed? box should not be Checked for this Cancel Signal record. iii.If (when) the Cancel (Abort) Code is subsequently received, it will cannot be processed automatically. iv.It must be manually completed by an Operator thereafter. •Cancellation Information: Enter the data requested below to identify the appropriate Cancellation Information for this CSID Zone. ✓Signal ID - Enter the specific Signal Identifier that would be displayed for the Operator that would indicate that the previously reported emergency condition, defined above, has been canceled by the Subscriber via a system reset/disarm action on their part. ✓Zone - Enter the Physical Zone Code, if one is transmitted with the Signal Identifier, that would be displayed for the Operator that would that would indicate that the previously reported physical zone code, defined above, has been canceled by the Subscriber via a system reset/disarm action on their part. ✓Hold (Seconds) - Enter the number of seconds that the originating Alarm Signal should be placed on Hold (automatically) while awaiting a possible Cancel (Abort) Code from the Subscriber. •Click the Icon to record your entry. ✓This Cancel Information and the Restoral Information (see above) are also included with the CSID Zones on the Subscriber Information Form Report. 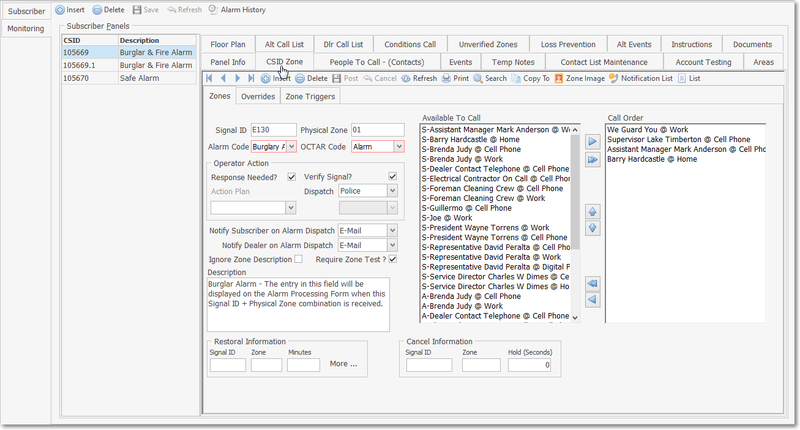 ❑(Re-)Setting the Call List Order - Each Alarm Signal may have the Subscriber's default Call List Order altered for a specific signal based on that Subscriber's needs. 1.The default sequence in which People To Call records were originally entered for a Subscriber Panel CSID. 2.The revised sequence established for a Subscriber Panel CSID using the Call Order Form. ▪All Global Call List entries available for this Subscriber Panel CSID may be used. 3.The specific Call Order established for an individual CSID Zone entered for a Subscriber Panel CSID. 4.The specific Call Order established for an individual CSID Zone Override record entered for a Subscriber Panel CSID. 5.The Call Order established in the CSID Zone Default Call List (CALL DEF) record entered for a Subscriber Panel CSID. 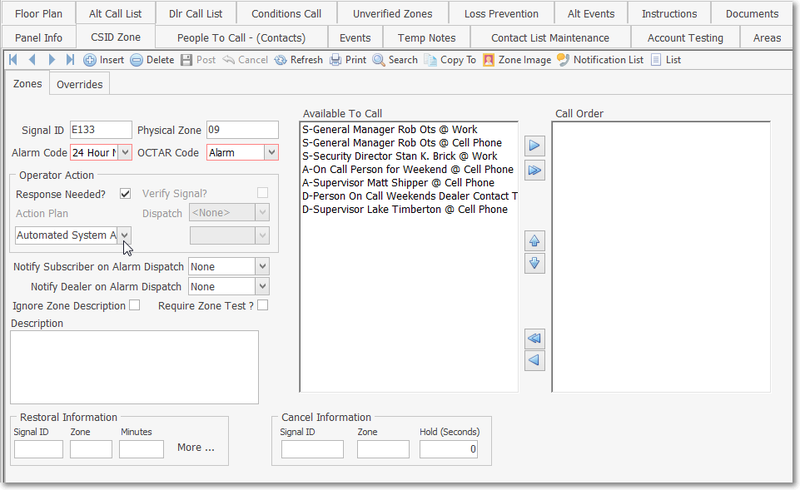 •Available To Call - This list contains the People To Call associated with for the CSID for which this CSID Zone is created, plus any others Contacts available from the Global Call List members (see above), and represents the default order in which Operator Notifications should proceed until someone is successfully notified. ▪Call List of Dealer - The Names associated with a CSID with the Call List for that Dealer for whom you are providing monitoring services this Account, which is identified in the Subscriber Panels section of the Central Station Data Form. 3)D - The Dealer Contacts. •(Re-)Setting the Call Order - This column displays the sequence - for this specific CSID Zone - in which the Operator Notifications should proceed until someone is successfully notified. ▪Select a Name from the Available To Call column and Click the right arrow to move that Name to the Call Order column. ▪To move all Names from the Available To Call column to the Call Order column Click the two-right-arrow cluster. ▪You may move Names up and down the Call Order column by Selecting them, and then Clicking either the up or down arrow, as needed, to relocate then to the desired position. ▪Select a Name from the Call Order column and Click the left arrow to move that Name to the Available To Call column. 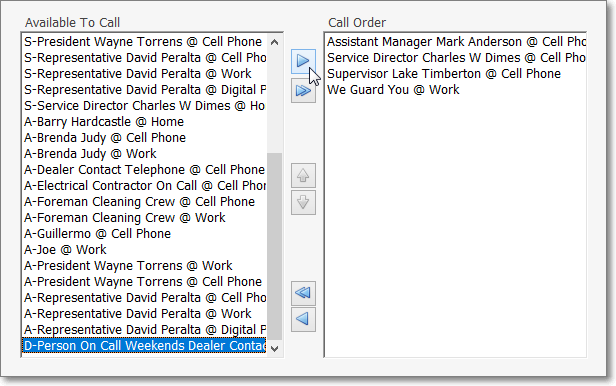 ▪To move all Names from the Call Order column to the Available To Call column Click the two-left-arrow cluster. 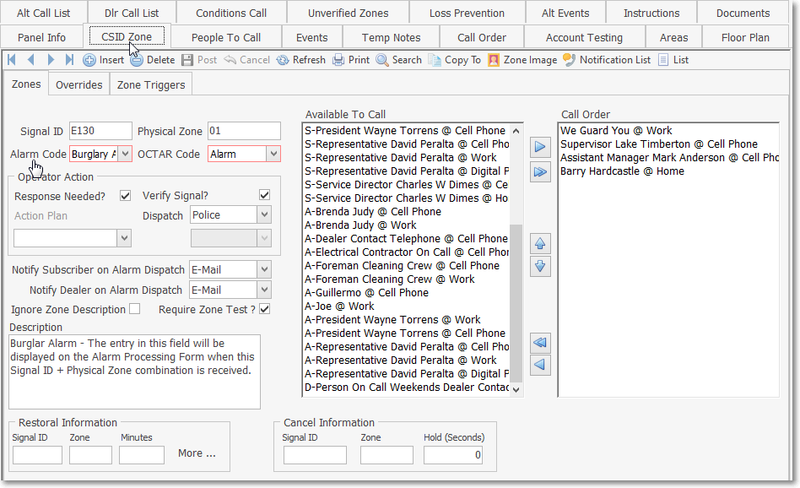 •Click the Icon to record the revised Call List Order for this CSID Zone. •Delete - If a User attempts to delete a CSID Zone record, a Confirmation message will be displayed. 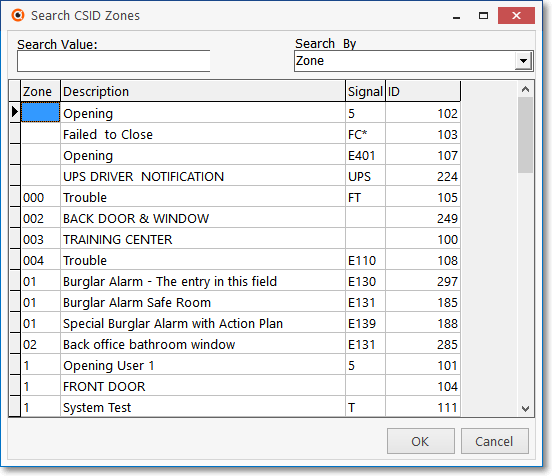 •Search CSID Zones - If you want to look up a specific CSID Zone, Click on the Search option on the Navigation Menu. ✓Search By - Select the method you'll use for this search with the Drop-Down Selection List provided. ▪Description - Search by the CSID Zone's Description. ▪Signal - Search by the Signal ID. ▪Zone - Search by the Physical Zone. ✓Search Value - Enter the appropriate characters to locate the desired CSID Zone. ✓Click on the desired CSID Zone record. ✓Click OK to select the record and return to the CSID Zones Form. •Print - Click on the Print option on the Navigation Menu to create a simple listing of the CSID Zones defined for this Subscriber. •Copy To... - You may copy all of the CSID Zones defined for one Subscriber Panel's CSID, to another Subscriber Panel's CSID (either to a different CSID installed at the Same Subscriber's premises, or to a Subscriber Panel's CSID for a completely different Subscriber). ✓It will display the Select CSID dialog. ▪CSID - Search by the CSID. ▪ID - Search by the actual internal record number. ▪Name - Search by the Subscribers Name. ✓Search Value - Enter the appropriate characters to locate the desired Subscriber to which you want to copy the currently selected CSID Zones. ✓Click on the desired Subscriber's CSID record. ✓Click OK to select the record to copy to, and then return to the CSID Zones Form. •Zone Image - You may add an image file - which will be available to the Operator - illustrating this specific CSID Zone. ✓Click on the Zone Image option on the Navigation Menu. ✓Add - Click the Icon to start loading Zone Image. ✓Description - Enter a brief description of the image. ✓Stretch Image to Fit - Check this box if the image you will select is small, and you want it to fill the allowable space. ✓Load - Click the Load button. This will display the standard Windows® Files Locator dialog. ▪The Image file you choose must be a ".BMP" file saved with 256 colors (or Less) and be no larger than 64K. ▪The file representing your CSID Zone must be on your Computer (or, if you're using a Networking System, on the File Server where MKMS is installed). ✓Save - Click the button to save the currently selected image. 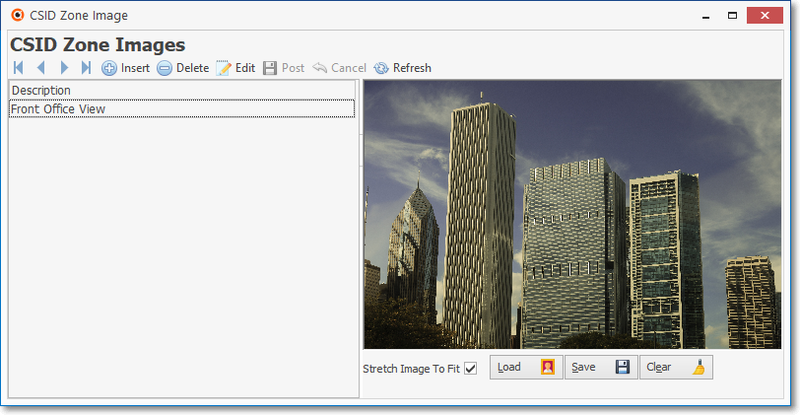 ✓Clear - Click the Clear button to remove the currently selected image. 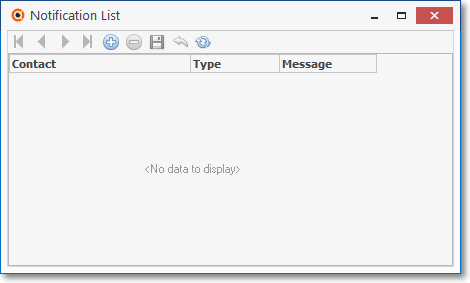 •Notification List - For Communication Module users, each CSID Zone (and Override) may have an additional Notification List for Paging and/or Emailing an Alarm or Event Signal Notification of this event, as needed. ✓Click on the Notification List Icon on the Navigation Menu. ✓Add - Click the Icon to create a new record. ✓Contact - Use the Drop-Down Selection List to Choose the person to contact from those entered on the Communications tab of the People To Call Form for this Subscriber Panel CSID. ▪Select only those People To Call who have Email and/or Paging information defined on the Communications tab of the People To Call Form. ▪Global Call List entries (which - in addition to or in lieu of the Subscriber's People To Call - include the Alternate Call List and Dealer's Call List assignments of People To Call, if defined) are also available in the Notification List selection. ✓Type - Use the Drop-Down Selection List to Choose the method (by Email, Page, or RS232) type for how this message to be sent. 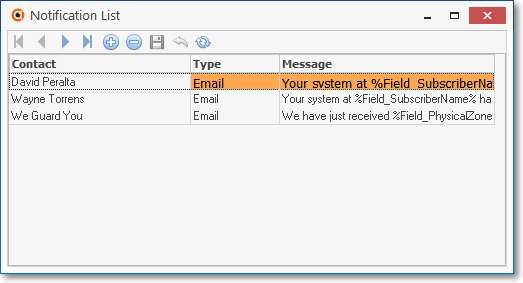 ✓Message ID - Use the Drop-Down Selection List to Choose the appropriate Predefined Message you want transmitted when the event occurs. ✓Save - Click the Icon to save the entry. ▪Once saved, the Names are automatically sorted Alphabetically. 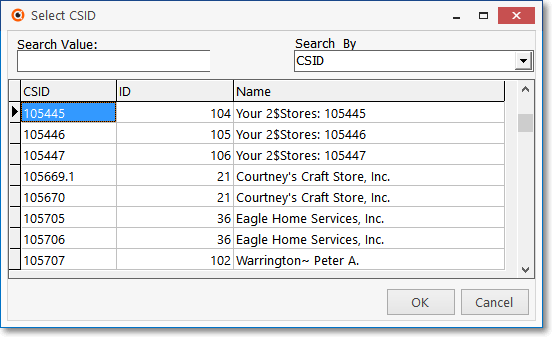 •List - This option displays a tabular view of the CSID Zone records. ✓Click on the List option on the Navigation Menu. ✓Click the List Icon to display the associated Grid Data. ✓The columns of Grid Data may be rearranged, filtered, and sorted. ✓Find - Enter text to search for a specific record, then Click the Find option. ▪Click on the Enter text to search... field and enter characters that best represent the specific record that you are searching for. ▪This is an incremental search from left to right. ▪As you type, based on the data type you've chosen, the record(s) that most closely matches your entry will be highlighted. ▪Click on an Account Testing record to Choose that record. ✓Print - To display the Print Preview dialog of the contents of the CSID Zones List, Click the Print option. ✓Click the List Icon again to return to the Record Editing section. ❑CSID Zone Overrides - The Overrides feature for CSID Zones allows you to modify the default CSID Zone procedures based on certain Days, or Times within those days, including Signal Processing Procedures, Action Plans, and Restoral and Cancel Information that was established for the selected CSID Zone. •See CSID Zone Overrides for more information. •See Signal Processing Order to better understand how SPA and MKMSCS attempt to validate an Alarm ( Event, Test, Restoral) Signal before declaring it an Invalid Alarm.